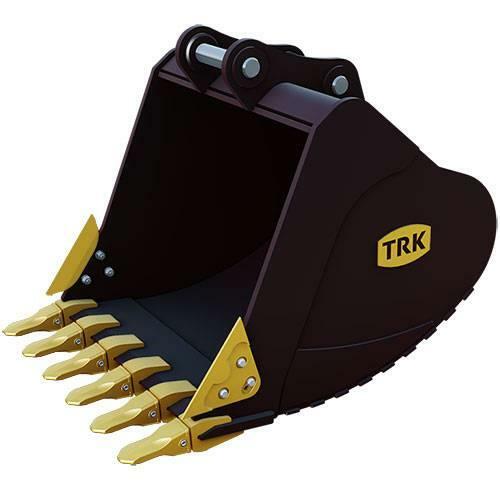 Øvrige oplysninger TRK's Digging Buckets are built to the highest industry standards, and they work with or without a quick couplers and thumbs. You can choose a deeper high capacity style, or shallow depth for sticky material. In either case we employ a double radius at the bottom of the skin to reduce drag. Bottom wear strips are always standard, and a diamond shaped structural bridge system is used in the upper works. High tensile Abrasion Resistant AR400 & T1 steel is always used at all critical points. Our steel is 100% sourced from Canada and USA. - Constructed from T1 & AR400 Steel at all critical points. - Comes standard with CAT style Rock Chisel J-Series teeth. Ask us about other styles of teeth. - D-Ring Lifting Lug welded on back. - AR400 Wear Strips come standard. Side cutters and additional wear components are optional (See Extreme-Duty Buckets). - Includes a 2 Year Limited Warranty. På Mascus kan du finde [Other] TRK SEVERE-DUTY DIGGING BUCKETS skovle. Prisen på denne [Other] TRK SEVERE-DUTY DIGGING BUCKETS er - og den er produceret i 2019. Denne maskine er placeret i - Canada. På Mascus.dk kan du finde [Other] TRK SEVERE-DUTY DIGGING BUCKETS og andre skovle modeller.